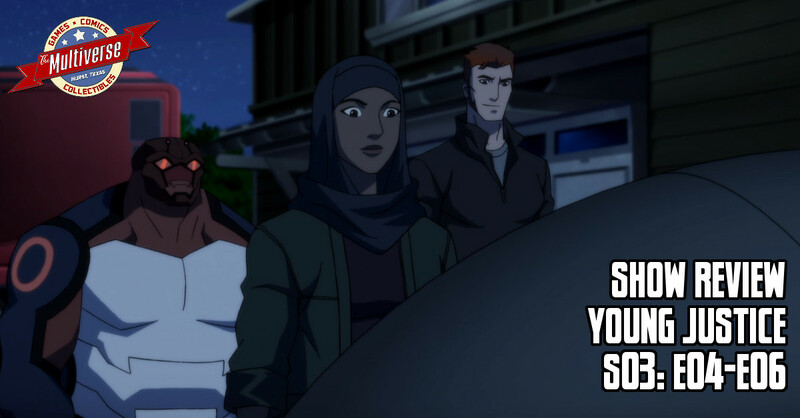 The first three episodes of Young Justice‘s highly-anticipated third season were a spirited action movie, centering upon a covert team, organized by Nightwing, attempting to shut down a metahuman trafficking network run out of a children’s hospital in the nation of Markovia. Though the team destroyed the trafficker’s base and thwarted a coup against the Markovian Crown Prince, they failed to stop the latest shipment of super-powered teens from being shipped off-world. The fourth episode, “Private Security,” sees the team trying to accommodate the refugees that they took in following the fight in Markovia. The mysterious Halo-Girl whom Artemis has basically adopted is having a hard time of it, as she remembers nothing of her old life. By contrast, Prince Brion can think of nothing but his banishment and his kidnapped sister Tara, and rankles at being confined to the home shared by Superboy and Miss Martian. The fifth episode, “Away Mission,” shifts focus back to the young heroes of the Justice League as Miss Martian leads a team to the planet of New Genesis. Someone is posing as the war god Orion and is sowing the seeds of conflict between the New Gods and the bug-people who live on the surface of New Genesis. Meanwhile, Prince Brion and Halo-Girl start testing the limits of their new powers. The sixth episode, “Rescue Op,” sees the two new heroes and Forager – a young bug exiled from his own people – joining together to investigate the rumors of a young woman with earth-bending powers who is in the employ of The League of Shadows. Naturally Prince Brion is convinced this assassin must be his missing sister. This leaves the more experienced heroes racing to stop the hot-headed young prince, before he bites off more than he can chew invading the island stronghold of Ra’s Al Ghul. There’s a lot to unpack in each of these episodes and more of the perfect balance of drama, action and comedy that made this series such a smash hit. It’s as involved and well-plotted as a good comic book. Indeed, I’d argue that Young Justice is better written than any Titans or Teen Titans comic published in the last decade and that DC Comics would do well to hire Greg Weisman to revamp their youth titles. That said, these episodes are a bit weaker than the first batch. “Private Security” has some good character moments, but the action is a little underwhelming. “Away Mission” suffers in that it has trouble balancing its large ensemble, so all of the subplots feel like they’re being short-changed. “Rescue Op” is the best of the lot, due to it primarily focusing on the new characters and some Easter Eggs near the end of the episode that are bound to make a lot of fans very happy. Still, even weak Young Justice episodes are better than most kids’ superhero shows and quite welcome after the long hiatus.